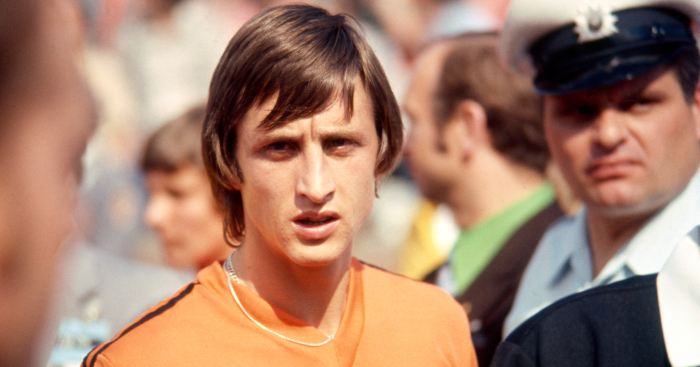 There are few, if any, cooler footballers than Johan Cruyff in the history of the game. You know his story by now: the prodigal talent who helped revolutionalise football both as a player and a manager; the philosopher who could eloquently opine on anything from politics and religion to ancient Egypt and the art of Rembrandt; the f*cking rock and roll star who wouldn’t suffer fools gladly. He’s the slick gunslinger who immortalised the No.14 shirt, the rebel who wore two stripes on his adidas shirts as he was sponsored by Puma, the avant-garde winger who embarrassed full-backs to such an extent he had a trick named in his honour and, for many Dutch youngsters in the 1960s, the footballing manifestation of The Beatles and Stones. The man described as “Pythagoras in boots” by writer David Orange could do it all. And he would look effortlessly brilliant as he did it. But Johan Cruyff, like every single one of us on this godforsaken planet, made mistakes. Even Johan Cruyff stumbled down the same trap which befell so many footballers who came before and after he tore up the rulebook and rewrote it in his own words. Johan Cruyff embarked on a career as a musician and released a record. A seven-inch single, complete with Cruyff on the sleeve looking resplendent, like some 1950s film star on the cover of a Morrissey record. And we’re sad to say it’s distinctly uncool. We’ll try to give some credit to ‘Oei Oei Oei (Dat Was Me Weer Een Loei)’, which roughly translates as ‘oh, oh, oh, yet another blow’. The song was written by Peter Koelewijn, one of the originators of Dutch language rock and roll. Released in 1969 on Polydor – the same year the label helped distribute seminal releases from Jimi Hendrix and The Who – the lyrics describe a luckless night for the singer’s cousin in which he is knocked out in a boxing match, gets ripped off in a pub, and finally returns home to be greeted by his angry wife. Once released, it reached number 21 in the charts in the Netherlands and sold even more records in Spain after he joined Barcelona. It has something of a charming, slapstick, knees-up quality akin to a Dutch Chas and Dave, but the recording tested Cruyff’s usual unflappable nature. When he took to the mic, the producer was dismayed to discover his vocal talents did not match up to his ability on the pitch. According to Dutch DJ and producer Marcelle van Hoof, writing in When Saturday Comes, a friend in the studio encouraged Cruyff to have a few drinks to relax. Feeling a little less tense, his tipsy rendition was deemed passable. But when it came to performing the song live, his nerves resurfaced. Having been invited to sing a rendition on Dutch television, Cruyff spent the whole time staring at the floor, mumbling the few words he could remember. The man who could be so expressive on the field was left, possibly for the first time in his life, appearing awkward and embarrassed. It seems unfair that Cruyff of all footballers should suffer this shame. If he can’t pull it off then nobody can. But then last year Koelewijn provided a brilliant insight into working with Cruyff in the studio. “That was during the period that we still made songs that we linked to current events,” he said. “Everyone was crazy about Cruyff then, and so I made a record about it. I had written a carnival-like tune for Johan. He would himself agree, but nothing came of it once in the studio. “He had no sense of rhythm and was very nervous. That’s why I asked him if he wanted something to drink. ‘Give me a cola-tic,’ he said. That is a mix of coke and gin. And then he asked for another and another one. Now well inebriated, Cruyff also revealed to his producer that during televised Ajax matches, he would deliberately win free-kicks and feign injury in front of the advertising hoardings of his personal sponsors in order for them to gain more exposure. And there it is. Just when we thought Cruyff was as fallible as the rest of us, he lets it known that it was always his world, and we’re just living it. Johan Cruyff didn’t need a career in rock and roll to be a rock and roll star. That was always the point.